Powerful professional 5 Watt hand held radio (Walkie Talkie). The most popular Walkie Talkie for general use. Professional 2 way hand held radios complete and ready to go. Ideal for individuals and small business who have a general communication need. With a clear open area range of up to 25km and a built up area range of up to 10km, these licensed radios have a much greater range than the license free equivalents. Pack includes 1 x Mitex General High Power Walkie Talkie with antennas, 1 x Li-ion Battery Packs, 1 x intelligent charging pod, instruction book and License form. All pre programmed and ready to use straight from the box. There is a very wide range of accessories available for this and all Mitex hand portables. 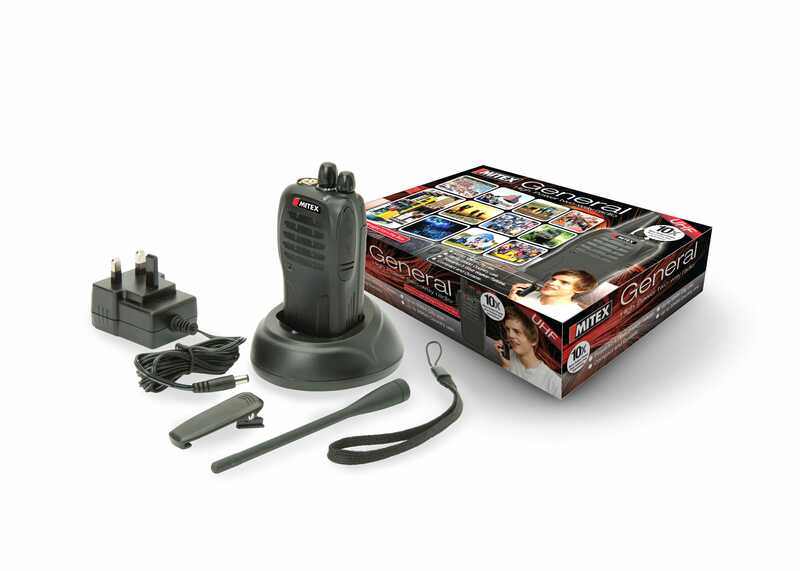 Mitex General is our most popular Walkie Talkie for general use. These Professional 2 way hand held radios are complete and ready to go. Ideal for individuals and small business who have a general communication need. Why buy the Mitex General Single Pack UHF from Connectec?